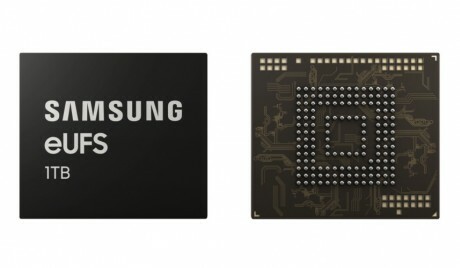 Samsung has a new storage chip for phones that can hold twice as much data in the same space as last year's chip, and enables faster data access. The new embedded Universal Flash Storage (eUFS) 2.1 chip can store 1 TB (1,000 GB) of data, in the same size as Samsung's 512 GB eUFS chip introduced in late 2017. 1 TB is enough for over 43 hours of 4K video. The new chip is also up to 38% faster at reading data, and up to 25% faster at writing, compared to Samsung's 512 GB chip. eUFS chips provide internal storage for phones, which is distinct from RAM and removable memory cards. If the past is any indication, Samsung will likely use the chip in its next flagship phone, the Galaxy S 10, which is slated to be announced on February 20th. Samsung today announced the first part designed for mobile devices that can store 512GB of data. The solution effectively doubles the amount of internal storage a high-end phone can ship with. Apple today announced the iPhone 7, the latest version of its flagship product. The device is machines from aluminum and features a refreshed design.